Care Well Medi Hub is proud to be a pioneer in the use of Ozone therapy since 2005 in various diseases like Cancer, hepatitis, infections, non healing wounds, ulcer, and anti-aging. Ozone has been found to be an extremely safe medical therapy, free from side effects. In a 1980 study done by the German Medical Society for Ozone Therapy, 644 therapists were polled regarding their 384,775 patients, comprising a total of 5,579,238 ozone treatments administered. There were only 40 cases of side effects noted out of this number which represents the incredibly low rate of .000007 per cent, and only four fatalities. 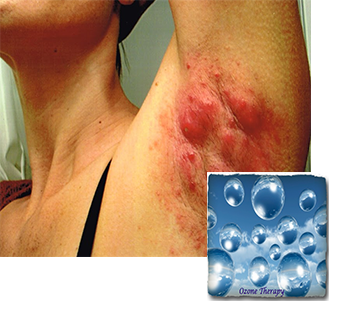 Ozone has thus proven to be one of the safest medical therapies available. The use of Ozone for medical therapy is well established, being vigorously pursued by many clinicians across the world. It enjoys wide international acceptance particularly in countries such as Germany, Russia, Canada, South Africa, Japan, many states in the USA, India and so on. Ozone stimulates the production of white blood cells. These cells protect the body from viruses, bacteria and fungi. These cells malfunction if deprived of oxygen. They fail to eliminate invaders and even turn against normal, healthy cells (allergic reactions). Ozone significantly raises the oxygen levels in the blood for long periods after its administration. As a result, allergies have a tendency to become desensitized. Interferon levels are significantly increased with ozone. Interferons are globular proteins that orchestrate every aspect of the immune system and inhibit viral replication. Ozone stimulates the production of Tumor Necrosis Factor. TNF is produced by the body when a tumor is growing. Ozone stimulates the secretion of IL-2. Interluekin-2 is one of the cornerstones of the immune system. It is secreted by T-helpers. T-helper causes it to produce more IL-2. Ozone's main duty is to induce lymphocytes to differentiate and proliferate, yielding more T-helpers, T-suppressors, cytotoxic T's, T-delayed's and T-memory cells. Ozone kills most bacteria at low concentrations. The metabolism of most bacteria is, on an average, one-seventeenth as efficient as our own. Ozone is effective against all types of fungi. This includes systemic candida albicans, athlete's foot, molds, mildews, yeasts, and even mushrooms. Ozone fights viruses in a variety of ways. As discussed above, ozone also goes after the viral particles directly. Ozone is antineoplastic. This means that ozone inhibits the growth of new tissue because rapidly dividing cells shift their priorities away from producing the enzymes needed to protect themselves from the ozone. Cancer cells are rapidly-dividing cells whose production is drastically inhibited through the administration of ozone. Ozone oxidizes arterial plaque. It breaks down the plaque involved in both arteriosclerosis and arthrosclerosis. This means that ozone has a tendency to clear blockages of large and even smaller vessels. This allows for better tissue oxygenation in deficient organs. Ozone increases the flexibility and elasticity of red blood cells. Ozone accelerates the Citric Acid Cycle. Also known as the Krebs Cycle or TCA Cycle, this is a very important step in the glycolysis of carbohydrate for energy. Ozone degrades petrochemicals. These chemicals have a potential to place a great burden on the immune system.